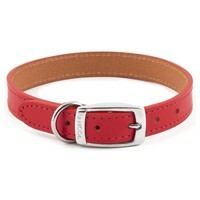 Ancol Heritage Leather Dog Collar is supple to handle but very strong in use. Heavy duty buckles and the D-ring complement the style and strength of the finished product. Using high quality bridle leather, the Ancol Collar enhances it's smooth texture. The Ancol Collar is water repellent, colour fast and of extremely high quality. Perfect for your dog!